I decided to try this book when it became available as an e-book through my local library and I’m so glad I did! I really enjoyed this compelling fantasy and now I want to read the rest of the series. Young Alanna of Trebond begins the journey to knighthood. Alanna has always craved the adventure and daring allowed only for boys; her twin brother, Thom, yearns to learn the art of magic. So one day they decide to switch places: Disguised as a girl, Thom heads for the convent; Alanna, pretending to be a boy, is on her way to the castle of King Roald to begin her training as a page. But the road to knighthood is not an easy one. As Alanna masters the skills necessary for battle, she must also learn to control her heart and to discern her enemies from her allies. Filled with swords and sorcery, adventure and intrigue, good and evil, Alanna’s first adventure begins—one that will lead to the fulfillment of her dreams and make her a legend in the land. 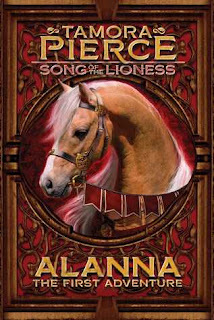 Song of the Lioness: Alanna was written by Tamora Pierce and this reprint edition was published by Atheneum Books for Young Readers in 2010 (originally published in 1983). I didn’t know what to expect but I really enjoyed the story line of Alanna pretending to be a boy so she could train to be a knight. The story moves along at a good pace and I especially liked the realistic details of how she hid her true identity. Alanna's character is determined and persistent, but she also has flaws which sometimes lead to trouble. The magic part of the story is intriguing, and I liked the friendships she developed. Lots of fun and adventure in this action-packed story! This is a good example of how to create a believable fantasy world without getting bogged down in details. I was able to connect with this character right from the beginning of the story. “That is my decision. We need not discuss it,” said the man at the desk. Tamora Pierce is the author of many novels for teens, such as The Protector of the Small series. I read this a long time ago and remember enjoying it too. Glad you liked it. Have to admit I've never read a novel by Tamora Pierce, though I have a young cousin who loves her books. They were quite popular when I first started working at the bookstore in 2002. I really should read one soon.